A story about 8 candidates. 1 Position. Who will be the finalist? A short Q and A follows with Helen Donnelly, filmmaker and Therapeutic Clown practitioner. LIMITED SEATS: ONE NIGHT ONLY. Proceeds toward Helen's Therapeutic Clown Certificate Program scholarship fund. Helen Donnelly was born in Flamborough and moved to Toronto in 1987. She is a theatrical, circus and therapeutic clown practitioner in healthcare. 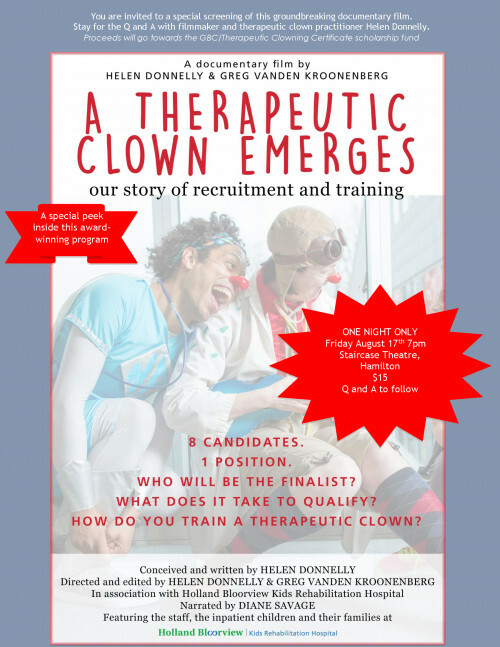 Helen has presented workshops globally and has recently created the world's second school for Therapeutic Clowning. This film fulfills a dream of showcasing the hidden world of healthcare clowning and seeks to showcase best practice.